Avoiding crowds during the holidays and sticking to my budget are two of my goals during the holiday season. When you have a large list of people you would like to celebrate the holiday with by giving gifts, it can be expensive. You can still stick to your budget for the holidays with inexpensive DIY gifts. Sticking to a tight budget can be extremely important for college students. 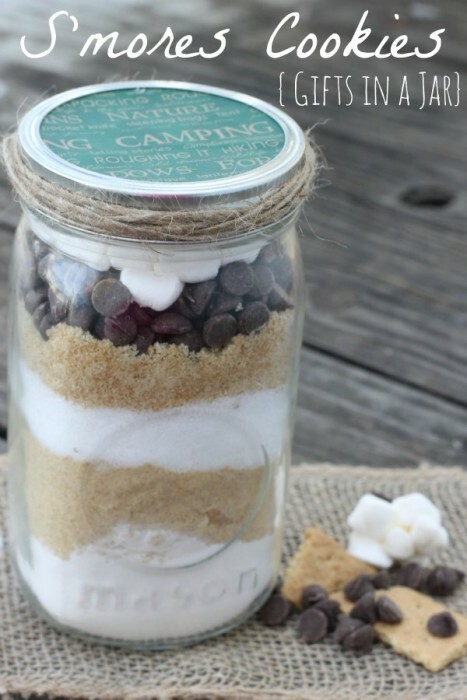 When you are short on time and cash, an inexpensive homemade gift option can be something as simple as an easy to make gift in an jar, homemade treats, or a tie blanket made with a favorite sports team. It is easy to make a gift in a jar like S’mores Cookies. 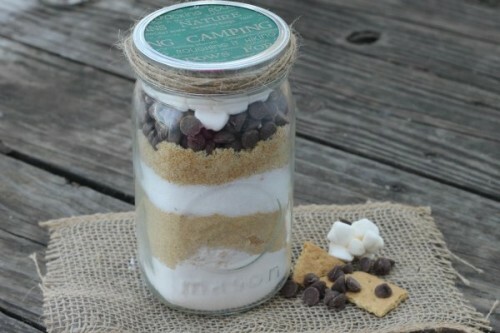 You will just need a few inexpensive ingredients along with a mason jar. 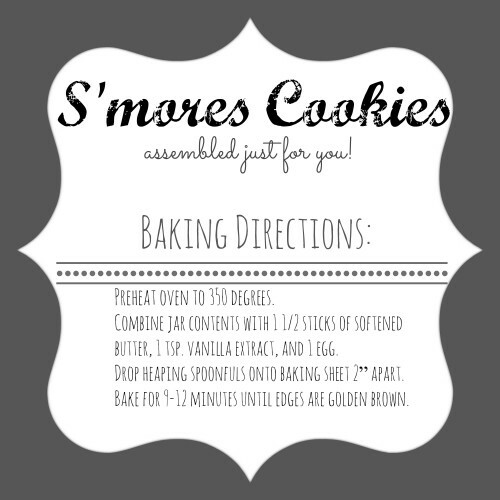 Print out our free printable with baking directions and you have an easy gift. You can also hand write the directions on a card to include with your gift. Break graham crackers up into large pieces and place in food processor or coffee grinder and process until crumbs are fine-almost like flour(or you can buy a box of crumbs in the baking aisle). In a medium bowl stir together all purpose flour, baking soda, and salt. Layer ingredients in quart mason jar in this order- flour mixture, graham cracker crumbs, granulated sugar, brown sugar, chocolate chips, marshmallows. Halfway through you will need to mash down your ingredients and again at the top, it is a tight fit. If you wish you can put marshmallows in a separate bag to avoid smashing them. To dress up my jar a little I wrapped the ring in twine, and cut a piece of patterned paper to the size of the lid. I wrote the baking directions on the back of the paper. Combine jar contents with 1 ½ sticks of softened butter, 1 tsp. vanilla extract, and 1 egg. Drop heaping spoonfuls onto baking sheet 2” apart. Bake for 9-12 minutes until edges are golden brown. A tight fit? More like an impossible fit! What size jar were you using? By the time I got all of the bottom ingredients in my quart-sized canning jar, even with tamping it down, there was only room for one half cup each of the chocolate chips and mini marshmallows, and even then it was full to the brim. I am selling these at a farmer’s market, so may need to look for a new recipe. Did you even make these things? Your article is very hard to read/ understand. Ingredients are not straight forward. How many cookies do these make? Great Gift idea! Thanks for the recipe! Thanks for linking up to Merry Monday! Sharing on our MM Pinterest Board! Have a great week!